Howza! It’s been a week since my last fibre/yarn purchase, and I’m surviving quite nicely. Me and my yarn stash could be on a nice little island somewhere and we’ll be just fine. I will admit my thoughts have turned to patterns and tools, the purchase of an electric de-piller is imminent but I’ve been planning that acquisition ever since Pransell showcased one on her blog. 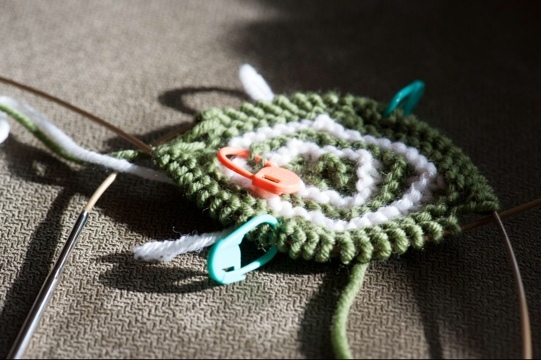 This week I completed my hairdresser’s pending baby’s Peapod Baby Jacket. I can’t wait to give it to her at my last hair appointment next week. She’s taking 6 months off, I fear she may not return and I’ll be down one awesome hairdresser… I got the buttons from Buttonmania, what do you think? I did enjoy making the little garment, despite it’s size I forget how long it takes me to make little things. It’s been so cold this week, I feel a little guilty for not making the matching hat, it’s so damn cold. My guilt may get the better of me, I still have a week and a half. I did say I was going to cast on the Op Art blanket for my sis this week, and here it is. 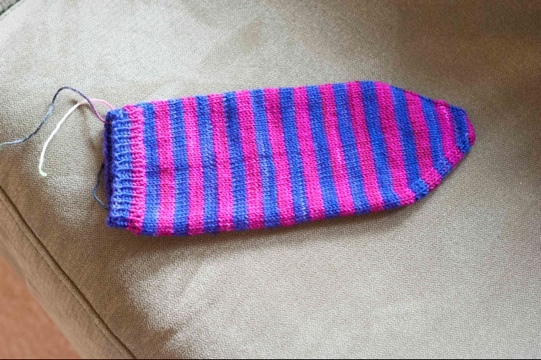 I still struggle with having more than one thing on the needles at any one time… I’ve completed Sharon’s first striped sock (minus the afterthought heel) and have begun the next. I’m hoping to finish these up before I get stuck into the blanket. What about my winer set??? Cute cardigan. What will you make your winter set out of? I’m excited to find out. I really like the buttons – they’re cute! 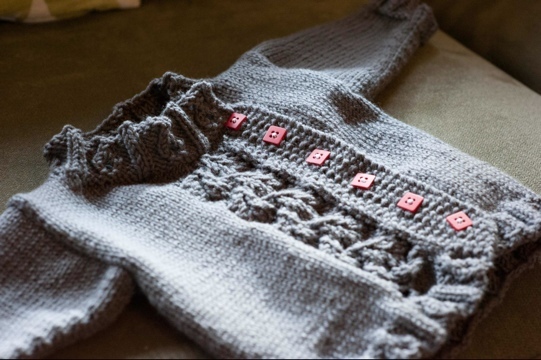 That is the cutest baby cardi and the buttons, [sigh] dreamy!